This article first appeared in The Edge Financial Daily, on July 29, 2016. 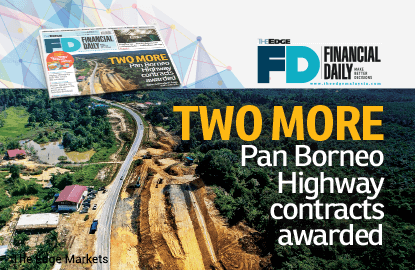 KUALA LUMPUR: Another two joint ventures (JVs) have clinched contracts under the Pan Borneo Highway project. Worth a total of RM2.87 billion, the two packages involve the development and upgrading of phase 1 of the highway in Sarawak. A JV between Naim Engineering Sdn Bhd and Gamuda Bhd was awarded a package worth RM1.57 billion. Naim Engineering is a wholly-owned unit of Naim Holdings Bhd. In separate filings with Bursa Malaysia yesterday, Naim Holdings and Gamuda said the JV is for the stretch of the highway from Pantu Junction to Batang Skrang. The contract, awarded by Lebuhraya Borneo Utara Sdn Bhd, is for a duration of 51 months from the date of site possession. Both Naim Holdings and Gamuda expect the contract to contribute positively to their earnings and net assets during the tenure of the contract. Naim holds a 70% stake in the JV, while Gamuda owns the remaining 30%. Mudajaya Corp Bhd, meanwhile, announced that it had bagged a RM1.333 billion contract under the highway project, for the stretch from Sungai Kua Bridge to Sungai Arip Bridge. The company said it will undertake the works together with Musyati Sdn Bhd under a 70:30 JV. The contract is targeted to be fully completed by October 2020, with a construction period of 48 months from the date of site possession, said Mudajaya. The contract is expected to contribute positively to Mudajaya’s earnings from financial year 2016. The two contracts announced yesterday follow another two awarded under the project earlier this week. A JV between KKB Engineering Bhd and WCT Holdings Bhd won a RM1.29 billion package, while a JV between Bina Puri Holdings Bhd and Cahya Mata Sarawak Bhd was awarded a RM1.36 billion package. The Pan Borneo Highway will connect Sabah and Sarawak. The estimated cost of the Sabah portion is RM2 billion, while the Sarawak portion is estimated to cost RM800 million. Naim’s share price fell three sen or 1.55% yesterday to close at RM1.91, giving the company a market capitalisation of RM450.19 million. Gamuda was down five sen or 1.03% at RM4.82, with a market capitalisation of RM11.66 billion. Mudajaya rose one sen or 0.8% to RM1.26, with a market capitalisation of RM678.38 million.